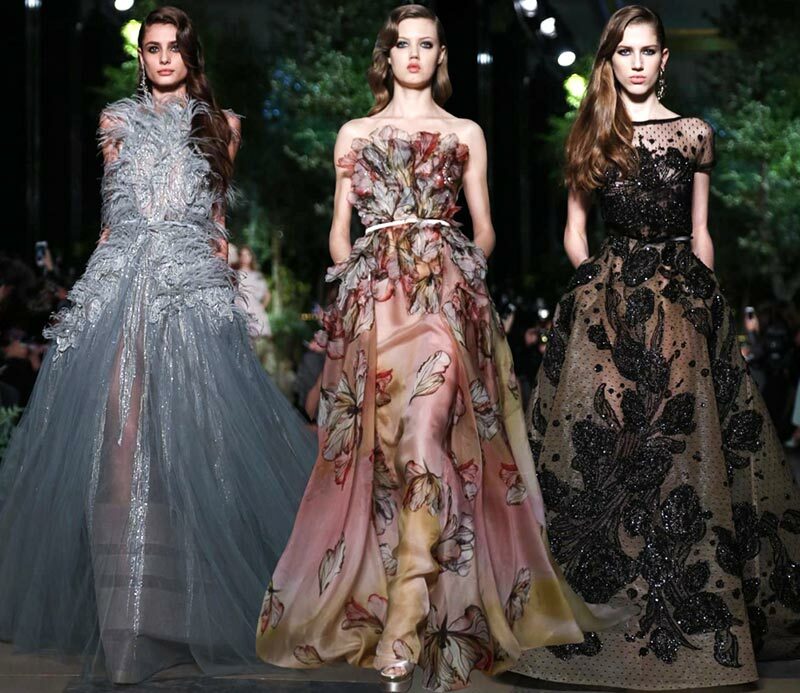 Against a backdrop of amazing Arabic musical numbers, the Elie Saab	Couture spring/summer 2015 collection show was as amazing as ever, with gowns that seemed to be fit for a fairy tale, showcasing the royal wardrobes on a simple catwalk for the average citizen to stare in awe. It is certainly as if we’ve entered a world of dreams and a satisfied smile plays on our lips as we indulge in incredibly detailed pieces of haute couture. 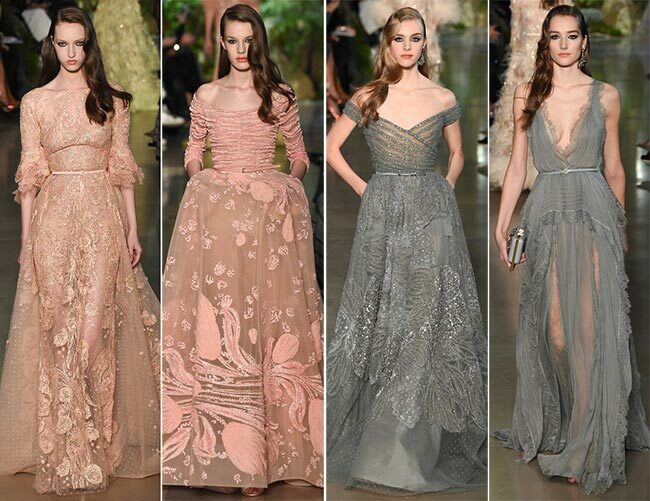 At one point locally known as Petit Paris, the city of Beirut in Lebanon became the home and inspiration of Elie Saab, a renowned fashion designer who began his career as a little eight-year-old boy raiding his mother’s closets for materials and using his sister as a model. Specializing in bridal couture from the beginning, Saab saw his reputation enhance from a young age, when his rich fabrics, lace, embroidery, pearls, crystals and silk threads suddenly began appearing as part of society’s influential women’s wardrobes. In 1997, Elie Saab officially became the first non-Italian member of the Camera Nazionale della Moda and showed off his first collection outside Lebanon a year later in Rome. 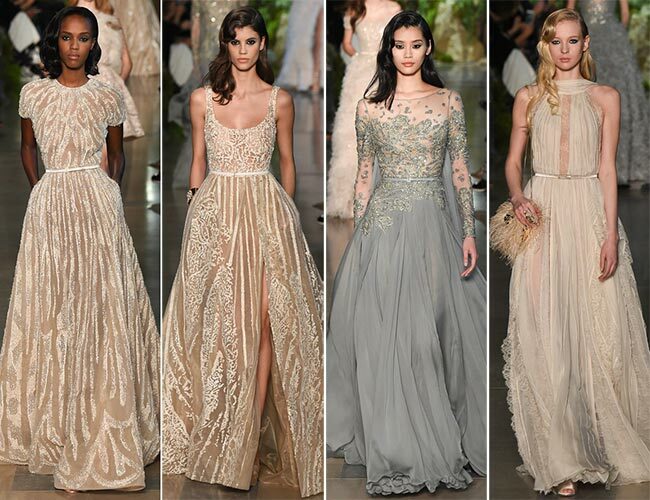 Elie Saab has garnered much attention with his ability to captivate the hearts of royalty, having Princess Stephanie of Monaco attend one of his first shows in Monaco and fashioned an incredible gown for Queen Rania of Jordan. To date, he’s dressed over 10 ladies of the royal lines around the world, from Sweden to Greece, Thailand to Luxemburg. In 2002, he entered the world of Hollywood stars when Halle Berry walked onto stage to receive her Oscar in an Elie Saab number, and then catapulted into the world of haute couture in 2003, before his designs became coveted by so many around the world. Feathers, ruffles, glitter, tulle! 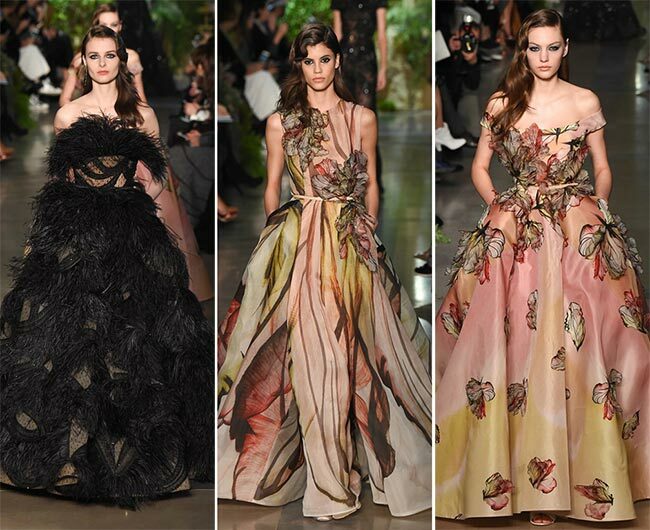 Gowns with long trains and off-the-shoulder designs rocked the runway at Paris Haute Couture Fashion Week during the breathtaking Elie Saab Couture spring/summer 2015 collection presentation. So much in transparency, whether the dress is black or white, pink or golden sunshine. The lightweight materials were entirely too perfect, while the deep C-plunges on some of the pieces had us completely captivated. 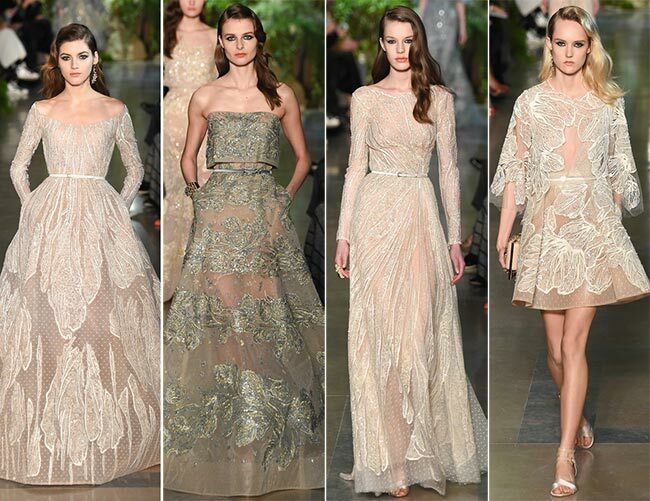 While most was all about glittering embroidery, some did show off a certain gorgeous silhouette under gently cascading materials. One lovely characteristic of so many was the addition of pockets, no matter how sheer the fabric seemed to be. 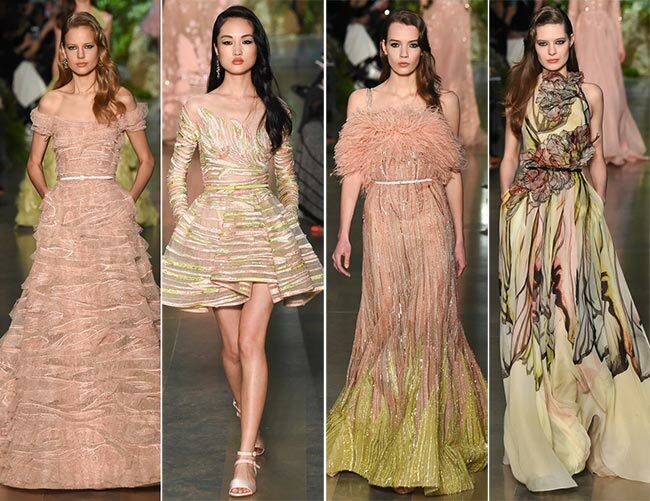 The hair seems to be trending with a deep side sweep with boho or Hollywood-style waves, the makeup focus on bolder lashes and heavily lined rims, with minimal attraction to the facial features, while the focus is brought down to the incredible pieces of lace, chiffon and organza. The wedding bells tolled and out came a majestic dress, in pale pinks and gold threads on white angelic drapes, glittering in the light, like one may have seen on the queen of the moon, should there have been such an extraordinary mythical creature. The petticoats gave the dress a much fuller look, somehow reminiscent of ancient ball gowns and impossibly layered couture. 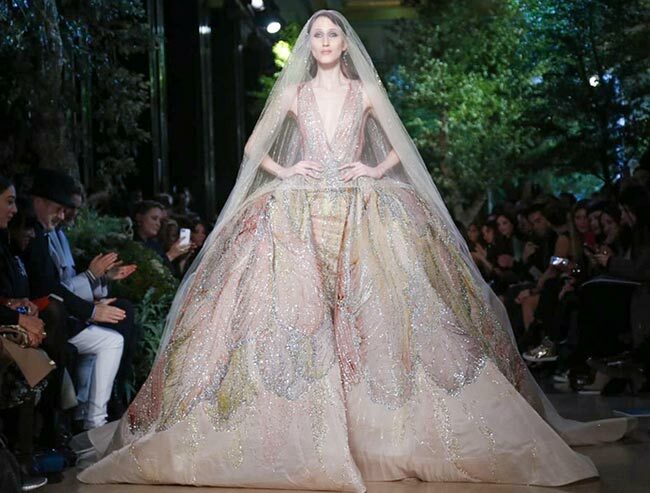 The cathedral train veil had as much in flittering golden threads as the rest of the dress, a breathtaking piece that is impossible to forget. “And if there were to be a message behind my couture collections, mine would be Thank You.’ This was the quote with which the Elie Saab Couture spring/summer 2015 collection show ended, while the hashtag of #ChasingADream seems to capture the whole of the experience so perfectly. 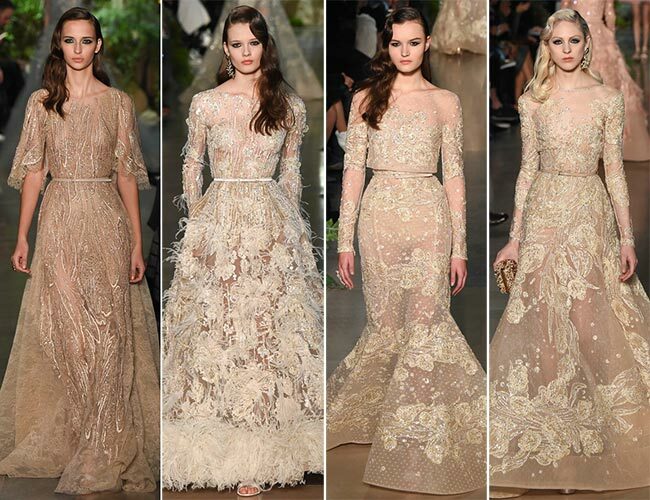 It certainly was as if in a dream and Eli Saab Haute Couture will certainly be going a long way.